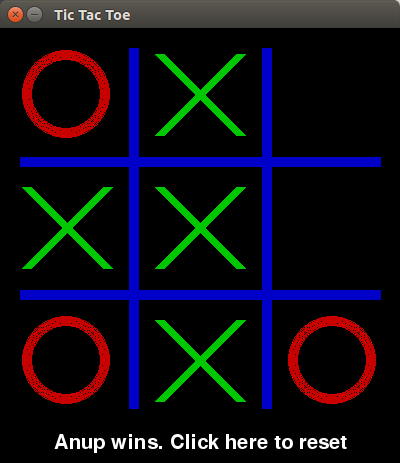 This is a simple tic-tac-toe application with AI using minmax algorithm along with alpha-beta pruning. The game is made in python using pygame. The first step to create the game is to make a basic framework to allow two human players to play against each other. The initial game can be found here. In this version, only two human players can compete with each other. '''Utility function for determining the numerical value of terminal condition. With only minmax algorithm, the computer takes about 3 seconds to make it’s first move (in my computer). The total number of moves analyzed by the computer is recorded in a variable. If the computer starts the game, it analyzes 549945 positions in the first move. It can be improved by using alpha-beta pruning. The ComputerPlayer code that implements alpha beta pruning is as below. With alpha beta pruning, the total number of moves analyzed in the first step reduces to 146119 from previous 549945 moves. The final game can be found here.